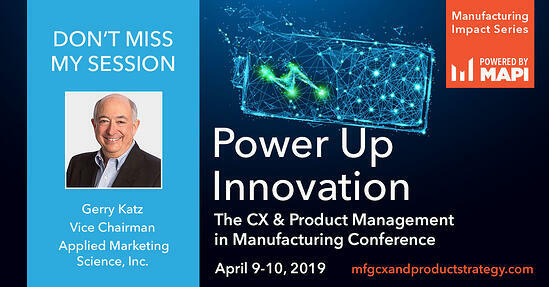 Join us at Power Up Innovation: The CX & Product Management in Manufacturing Conference, where AMS Vice Chairman Gerry Katz will be speaking on how to “Use Your Voice of Customer Process to Drive Results”. Gerry’s session will cover the proper role of Voice of the Customer (VOC) in innovation, 12 common mistakes to avoid in implementing your VOC program, and how machine learning and AI are revolutionizing the field. The conference is April 9-10 in Chicago and is designed for leaders in product management, quality, customer experience and engineering. It will introduce attendees to strategies, tactics, and technologies used across the manufacturing sector to create ground-breaking transformations in customer experience and product management. If you’re in the manufacturing industry and focused on customer experience and innovation, we invite you to register for the conference using our discount code. Just enter AMSCX2019 at checkout and you will receive $200 off your registration. Hope to see you there!